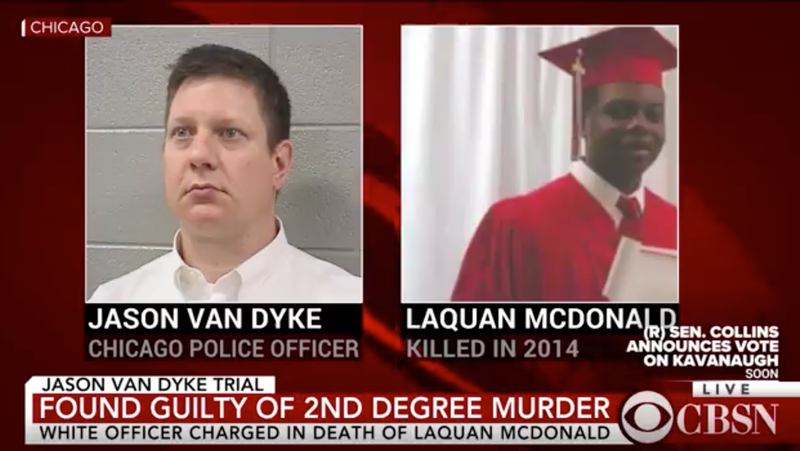 A jury found a white Chicago police officer guilty of second degree murder and several counts of aggravated battery in the 2014 shooting death of black teen Laquan McDonald. In a dramatic verdict, a jury foreman listed every guilty count of aggravated battery for every single shot that officer Jason Van Dyke fired into McDonald—all 16 of them. It was a haunting repetition. Van Dyke was found not guilty of a single charge: official misconduct. He can face 15 years or more in prison. Van Dyke’s attorneys claimed he was afraid for his life and simply acted according to police guidelines. Of the many high-profile incidents in which white police officers shot and killed black people who were either unarmed or non-threatening, few have even led to a police indictment. Laquan should still be alive, but this guilty verdict should act as a victory, a rare silver lining in a dysfunctional justice system. The headline on this post has been updated.